Genuine seal, which is still made from the old Volvo factory drawings. This rubber seal was introduced in 1969 and has an additional lip to prevent wind noise. It also replaced the earlier felt / rubber seal on vehicles up to 1968. It was therefore used from this time on in new cars in the factory and was delivered for earlier vehicles as spare. 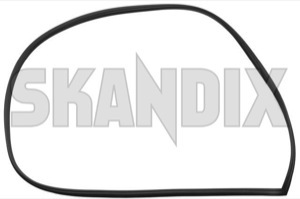 We also offer the earlier felt / rubber seal (Skandix 1045748, 1045749).